Developed by British-based racing engineers Cosworth, these buffers are specifically designed to be used in conjunction with Misab-plates. Nowadays produced by that same Misab company from Sweden, the mounts are strong enough to ensure an airtight seal while also providing enough vibration damping. Each mount consists of two cups and one rubber buffer. Install the Misab-plates, install your carb(s), install the Cosworth mounts using a Nyloc nut (NOT included in the standard set!) and set the distance between the cups to 2 millimeter, using a normal feeler gauge. The buffer is now set to the correct tension to dampen vibrations but not allowing air leaks. These mounts are supplied in sets of 4 complete mounts (as depicted) which is enough for one carburettor like a Dellorto DHLA, Solex ADDHE, Weber DCOM or Weber DCOE. 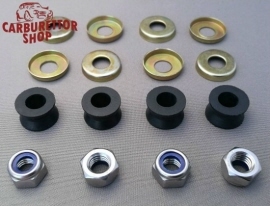 Following many requests from our customers, we have sourced superior quality stainless steel locking nuts in size M8 which is the most common size used on carburetor studs. For your convenience, you can select these from the drop box and order them right along with the buffers but please verify that your studs have that same, M8, thread.